You can make a difference in your community by… “adopting” your local food pantry and keeping its shelves stocked throughout the school year. Often, food pantries don’t have enough food on their shelves to feed all the families that come in for help. 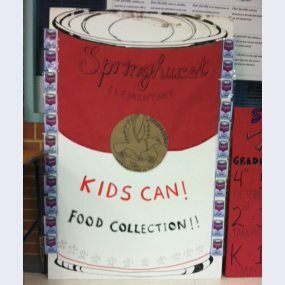 You and your classmates can make a difference by organizing a Kids Can! food drive and ensuring your local pantry’s cupboard stays stocked! Organize and use the resources of your school to get the message out…emails, backpack mail and notes home are the way to go! Think about it… your efforts will make food available for the hungry in your very own community. Imagine trying to find a job on an empty stomach or showing up at a physically demanding job without any food in your belly…or going to school hungry! You really can make a difference…… and by joining Kids Can!, you can help us make this a nationwide program – there are thousands of kids just like you all across America who could participate in this project…we just need to get the word out! Naturally, you have to work this out with your principal or teacher….and Kids Can! requires that an adult supervise the program. Print this out, go discuss it with your teacher or principal and hopefully you will then join our team. • Find a classmate or several to help you get things going. • You and your team of volunteers make some simple, colorful flyers to distribute in your school. Also arrange to have labeled drop-off boxes for each classroom/homeroom for kids to drop their donated items in. • Speak with your teacher or principal about a schedule which grades do which month (ex.1st & 2nd grade December, 3rd & 4th grade February and so on). • And don’t forget to plan for the holidays and summer vacation — your food pantry will still be distributing food even though school is out (for instance, in May and June have an extra grade level bring in food to cover the summer). • Talk with your team about ways to keep the enthusiasm up!! Be creative!! Talk to your adult supervisor too! Consider a Skype chat every other month with F-to-F founder Pam Koner and the classes that are collecting food that month! This is a great way to encourage involvement and help the kids in your school understand that they’re part of a national effort! To set up a Skype call with Pam, email her at pkoner@family-to-family.org. Remember…YOU CAN MAKE A DIFFERENCE…BIG TIME!